toryleadership: "Hopeful" Mail endorses X-factor Cameron "with some trepidation"
"Hopeful" Mail endorses X-factor Cameron "with some trepidation"
"The Mail believes constituency members should vote for David Cameron." The newspaper pays tribute to David Davis. It notes that his willingness to "articulate core Tory values" has been "refreshing" although his tax cuts strategy is described as "ill thought-out". The Mail also congratulates the two contenders on the way that the contest has been characterised by "dignity, good humour, an absence of spin and a respect for the public's intelligence". It believes that the Tory party's prospects are now "exciting". The party has an opportunity to elect David Cameron - who has "the X-factor or charisma to reach voters in a way no Tory leader has done in years" - at the same time that we can all "smell the beginning of the end" of Blairism. The Mail hopes that Mr Cameron will appoint the likes of Liam Fox, William Hague and Malcolm Rifkind to the Tory frontbench, and that this will address the danger of Mr Cameron's relative inexperience. The leader notes its disagreement with Mr Cameron on ecstasy but recommends a man who is backed by 54% of 154 Tory Association Chairman surveyed by today's Mail (24% backed DD). "The Tories have succumbed to despair for too long... this is a time to choose hope," the newspaper concludes. How very Clintonesque! The Mail is said to be read by a quarter of Tory members and its leader will be read widely amongst the target electorate. With The Times having already declared for David Cameron (on Wednesday), The Telegraph and The Sun are the two main Tory-read papers left to declare. 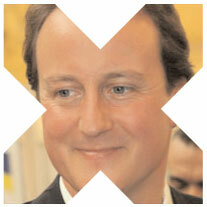 Given The Sun's past criticism of Mr Davis it seems likely that it will declare for Mr Cameron, too. The Telegraph (read by half of Tory members) is the most prized endorsement. Last week it encouraged its members not to vote yet and ask tougher questions of the two contenders. ConservativeHome understands that there may be a difference of opinion between most of the newspaper's editorial staff and the newspaper's management. The editorial staff are keen to endorse Mr Cameron soon; the management and owners have apparently been more cautious. Tricky one for the Barclays, who are instinctively more DD than Cameron, and who are close with Heffer. Most importantly, they don't want to be seen backing the loser. But backing Cameron? What if they back Cameron, and Cameron lasts just 2 years (as I suspect), and then it's back to DD? Two years! More like twenty. IDS only lasted two years because he didn`t have the support of MP`s. DC will have the majority of MP`s with him and also will probably have more members with him than IDS. I hope that once they have lost the election those who have supported the losing candidate will show loyalty to our new leader and the party and will back the leader one hundred per cent. Anyone who is not prepared to do that should go and find themselves another party where they can go on losing elections. This is a hammer blow for David Davis. This was the one endorsement I thought he'd get, after the Mail's smears on Cameron early in the campaign. Simon Heffer jumped ship to the Telegraph & DC looking a shoe in = Mail gradually moving behind DC ( also life more interesting in Telegraph Towers with most editorial staff lined up on DCs side v SH & the management ). Note SH in todays column rejecting advances from DCs camp for a ceasefire...the war goes on. Jack, I hope it is 20 years, really I do. I think it's possible that he'll be great. Equally, I think it's possible he'll cave in quickly under pressure. I don't know how you or I or anybody else can possibly tell. That's inherent in the situation: a young man with little real experience of the world and no experience of the struggles of life - but also with a lot of potential and charm. This is not a criticism. What's good about Cameron is also what's so risky about him, that's all. "This is not a criticism. What's good about Cameron is also what's so risky about him, that's all." To be honest thats the most honest, clear and true Cameron "criticism" I've heard throughout the whole campaign. I've been a Cameron supporter since May, and that has been the only doubt I've ever held about him, that he might cave in under pressure. This should be easily avoided, if DC wins then DD needs to concede defeat gracefully, and throw his support behind Cameron. More party infighting and more confidence votes does not make us look like a credible government in waiting. I also hope that the front bench will hold some of the "old guard" to contribute experience, but the only way for younger members of the party to gain experience when out of government is by putting them on the front bench, and that is what we must be prepared to do. I can't wait to see DC's cabinet lineup with Osbourne, Rifkind, Davis, Fox, May and all of the other strong members of the party, young and old. An important thing to remember is that while people keep on saying "The new leader should make William Hague such and such and Kenneth Clarke such and such" is that offers have been made since 1997 to these people and every offer turned down, people are only going to be appointed if they accept an offer from the person making the appointments and such an offer is open. The Mail doesn't mention IDS for Cameron's shad cab. The party needs his commitment to poor communities and he could help rebuild UK relationships with the USofA. Sir Malcolm Appeasement Rifkind won't do that. No wonder the Mail likes Sir Malcolm Appeasement Rifkind. It is a newspaper of appeasement. It appeased Hitler in the thirties + it wanted to appease Saddam today. I can't understand why the Telegraph hired someone as lowbrow as Simon Heffer. Chris, if we really could have a cross-party, cross-generation team really pulling together, helping, protecting and encouraging each other, then just thing what we could achieve. I meant, of course, "spend time together", not "spend together", a mortifying slip. I don't think there is any prospect of the Telegraph not backing Cameron now. The polls show that a large majority of Tory members (who are also their readers) want Cameron as leader and their editorials to this point have been very receptive to the idea of a Cameron leadership. I think it's almost a foregone conclusion at this stage. Well Cameron had better start sounding less wishy-washy than on Any Questions.......he really does need an Alistair Campbell to feed him his lines. Yet another anon,Ken Clarke told me the only cabinet job he'd been offered was Deputy Leader in 1997 by Hague.I have a feeling that if he was offered something very senior by Cameron he would take it.However with Cameron being offered support by all and sundry perhaps Cameron would not feel the need to offer KC anything.Personally I feel that would be a shame. IDS would be an interesting choice for International Development but I hope Sir Malcolm is kept in a very senior role.